Combination snack cups have come a long way since the classic Kraft cracker and cheese spread Handi-Snacks of the 1980s, and nostalgic Betty Crocker’s cookie and frosting Dunk-a-Roos of the 1990s. Consumers are on the go now more than ever, and snack foods are mobilizing. Combination packaging, or two-in-one dual packaging, is a great way to get products that are not on-the-go friendly, like hummus or cereal, to be used away from home. Pairing these products with a more useable snack food item makes combination packaging an easy on-the-go grab for consumers. 1. 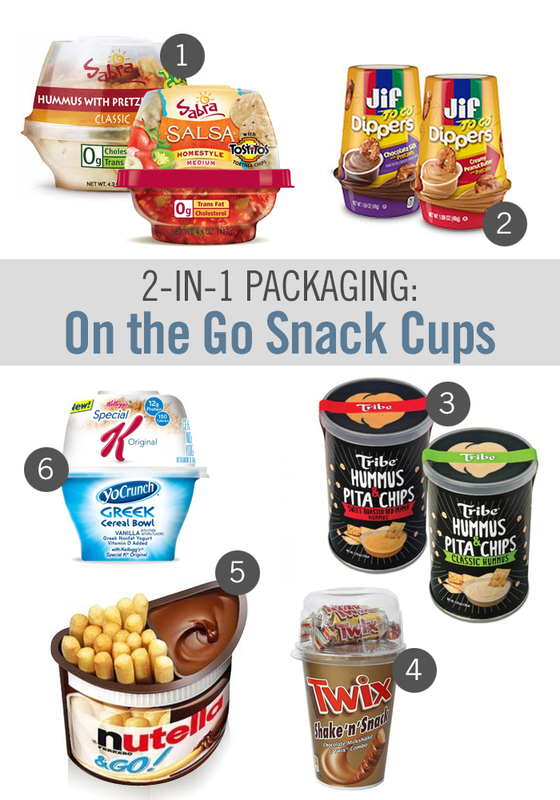 Snack cups by Sabra are available in several combinations, such as hummus /pretzels or chips /salsa. 2. New Jif To Go Dippers offer a canister of pretzels with a dipping cup of regular peanut butter or chocolate peanut butter. 3. Tribe’s new hummus and pita chips tube is a quick grab-and-go snack solution. 4. Twix Shake’n’Snack provides an easy way for Twix-lovers to enjoy the treat and milk together, or make a milkshake. 5. Nutella & Go! comes with cookie-like breadsticks and offers consumers a convenient, and tasty, way to take their Nutella hazelnut spread on the go. 6. YoCrunch and Kellogg’s cereal paired up to create a number of new cereal bowls – available in Special K, Fruit Loops, and Frosted Flakes. The yogurt cup has previously been available with such toppings as Oreo cookies and M&Ms. What do you expect we will see next in combination packaging?